The conversation Raul Garcia records below took place in 2012, the day after the picture at the left was taken. You can find the strange details of Ramseys legal story here. Ramiro “Ramsey” Muniz is currently serving a life sentence in the Beaumont Medium federal prison in Texas. In March of 1994, Muniz was arrested in Dallas, Texas and accused of participating in a conspiracy to sell powdered cocaine. Now 75 years old, Ramsey walks with a cane. Since there is no longer any parole in the federal system, he will die behind bars barring a presidential commutation. 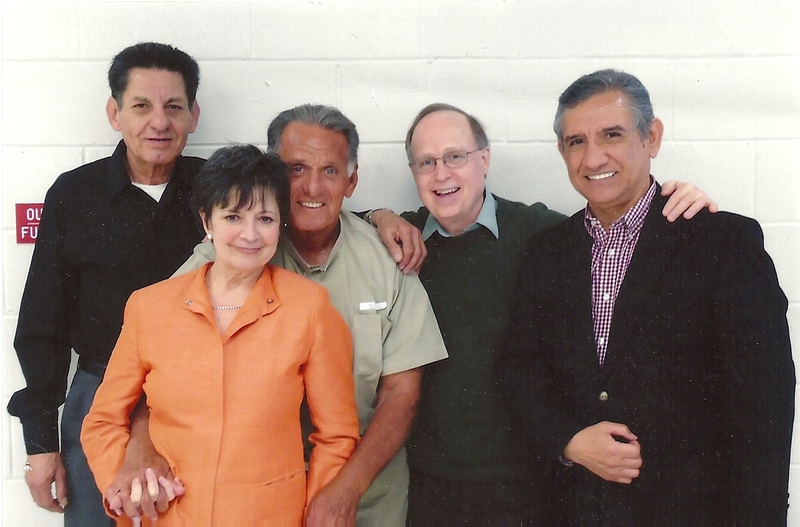 As I prepared to visit Ramsey Muniz, a political prisoner for the last 20 years, I thought about the many years we have known each other. In fact, we go all the way back to high school days. Though each visit through the years has been educational and inspirational, there seemed to be something different and special about this visit. We had scheduled the visit for April 22, 2011 without my realizing it would fall on Good Friday. Maybe that’s the reason, as I dressed that morning, something seemed to be guiding me toward my black clothes — a symbolic color of what happened on Good Friday in 33 A.D.
Let us keep in mind that Jesus was betrayed by some of his closest followers, some for money, others because their egos mattered to them more than the one who had come to speak in the name of Justice. Yes, justice is also a form of salvation, both individual and social. Muniz thinks that he, like Christ, was betrayed, as the years went by, as the silence of some who were close to him during the movement ran scared, like the followers of Jesus who scattered and hid in and around Jerusalem. After our theological conversation Ramsey touched on other matters. He said he’d been thinking of Cesar Chavez, the great civil rights leader whom Archbishop Mahoney of Los Angeles called the prophet of the poor. Ramsey said that Chavez once told him that La Raza was no longer afraid, that the people would no longer hold back and would speak without fear. He said that Chavez was convinced that the future would be ours. This is why Ramsey Muniz says that we need to reach the young, for they appear to be clueless about our history and do not seem to know what is going on in the world. There is no excuse for this, he says, given the power of the Internet as a vehicle for communication within the masses. I mentioned to him that this is how the Zapatistas in Chiapas had gained world-wide support by mastering the new technological forms of communication. Mastery of this modern form of communication, he says, is going to be a major key in the role we play in the 21st century. He says that history is on our side, that the rising speed of the growing Raza population is overwhelming the centers of power which do not know how to handle us other than by passing futile immigration laws. Laws cannot stop the inevitable.